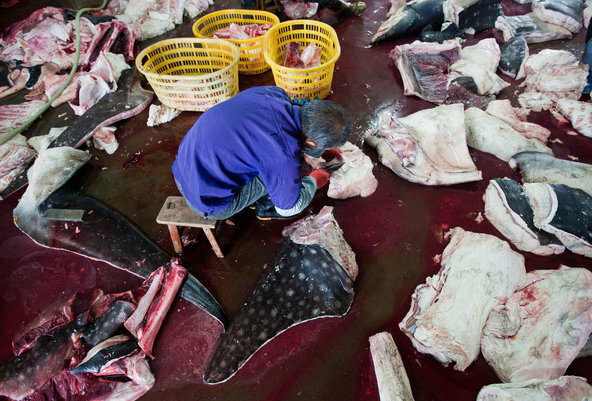 Smithsonian Magazine is running disturbing pictures from China over the slaughtering of whale sharks, an endangered species. Other publications have clearly equally disturbing images. The Chinese market has long been identified as the greatest threat to endangered species other than development. Chinese continue to demand exotic or endangered products for folk medicine or just the cache of eating rare foods. The result is disastrous for the world environment and continued unabated. The story this week offers another glimpse into China’s insatiable appetite and also shows the appalling health and sanitary conditions for such Chinese companies. WildLifeRisk exposed what it calls “the world’s largest slaughtering facility for whale sharks, operating near the southeastern Chinese city of Wenzhou. It estimates that the facility processes an estimated 600 whale sharks each year to be used for cosmetics, traditional Chinese medicine, leather products and, of course, shark fin soup. According to one report, some shark products were being labeled as tilapia, a farmed fish. The name of the factory is perfectly Orwellian: “China Wenzhou Yueqing Marine Organisms Health Protection Foods Co Ltd.” It openly traffics in the slaughtered animals with weigh 20 tons and can be sold for up to $30,000 each. It is the type of business that strives in the corrupt Chinese system. While the company boasts that it is perfectly legal and transparent in its work, calls from reporters were met with hostility and no comment. China’s record on endangered species and the environment (let alone humanitarian violations) raises the question of why a boycott like the one against Israel is not in place. I am reluctant to buy such products not only because of a lack of trust of the conditions and sanitation of Chinese factories but the support of the Chinese system generally. China nees to stop its war against Mother Earth. I don’t want anything from China either. But as long as people in other countries insist on buying cheap garbage from China, it will continue its practices: Capitalist spillover costs based on greed, Communist style lack of care as shown in Lake Karachay in the USSR. Disgusting. Another example why I try to avoid buying any product made in China. do business in a country that treats endangered animals like this??? Not to mention the human rights issues in China…. Of course they have also gone down in quality as a result…..